Have you ever wondered how to read military time quickly and easily? Or even wondered what it was, or why it exists? Well, welcome to the Internet’s greatest authority resource on just that! On this page, you will find the answers to that and more in great detail, in other words, everything you will ever need to know about military time (or astronomical time), as well as some quick and easy tips on how to read it. It is based on a 24 hour clock, and is a method of keeping hours in which the day runs from midnight to midnight and is divided into 24 hour increments. It is the most commonly used interval notation in the world. A side-by-side look at the 12 hour clock times and the corresponding military/24 hour clock times, provided exclusively by Military Time Chart. 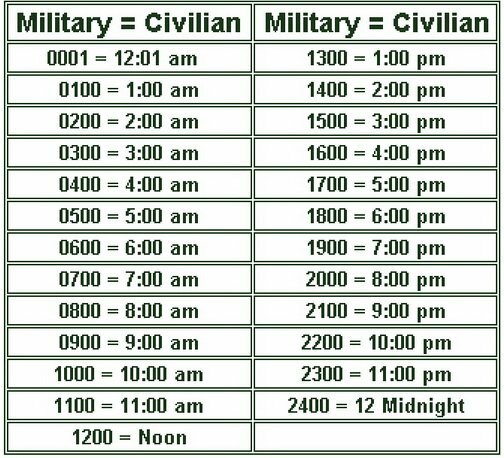 You may use this as a military time converter, or reference it as a military time conversion chart. When keeping hours in this fashion, the day starts at midnight and is written as 00:00. The last minute of the day is written as 23:59, or one minute before the next midnight. Sometimes you may see 00:00 written as 24:00. Both are acceptable. A usage example showing the 12 hour clock vs military time would be a time table showing 4:00 pm to 12:00 midnight. This would be written as 16:00 – 24:00. Another example highlighting the difference between the two would be to show that 10:15 am is written as 10:15 in military time but 2:30 pm is written as 14:30. This method of keeping time is most commonly used by the military, government, public transportation, hospitals, meteorologists, astronomers, those employed in emergency services, and also with computers. When speaking in military time, 07:00 may be stated as “zero seven hundred” or “oh seven hundred”. Also, in the military, these time stamps are often written without the colon, so 07:52 would rather be written 0752. Time stamps referencing Greenwich Mean Time (GMT for short – often interchanged with Coordinated Universal Time/UTC) is denoted by a “Z” at the end, and is written as 0752Z. The local time is denoted by a “J” at the end, and the eastern time zone is denoted by an “R” at the end. Each of the zones have a corresponding letter and name. For other methods of keeping time, see our article on the lunar calendar, the Mayan Calendar, the Chinese Calendar, the Gregorian Calendar, and All About Sundials.